Commercial property owners and homeowners in the area know that regular and proper gutter cleaning can save them the need for repairs and a lot of problems if water damage occurs due to clogged gutters. Ashlee House Cleaning will help get your gutters clean safely, at an excellent price. Our gutter cleaners use professional powerful vacuum cleaner with telescopic pipes to get into your downpipes and gutters and clean them without the use of ladders. The pipes have cameras, so that all dirt and debris is visible. We can show you before and after photos of your gutters. This service comes with a quality guarantee of 1 month. In case your gutters get clogged during that period we will clean them again. Choose the services of our roof cleaners and receive proper, top quality office or house roof cleaning. The cleaners use jet washing gear to rip out lichen, mould, algae from roofs. All our services are fully insured. You will enhance the appearance of your home and will protect your roof from any kind of damage that may grow due to debris and other residues accumulated on it. The cleaners can use only water, and environmentally friendly and fully safe cleaning solutions. Be sure that your windows are clean, and that your gutters and roof are free of debris - request our professional window cleaning service now! As we have actually informed you, Ashlee House Cleaning uses 100% safe procedure for all domestic and commercial window cleaning orders we receive. The enthusiastic window cleaners Finchley N3 use purified water. The nature of water in this demineralised state is to strive to return to its natural impure state by actively absorbing all minerals, dirt and chemicals it comes across. With continued use this system actually sterilizes the whole window and frame removing all detergents and chemicals used previously. 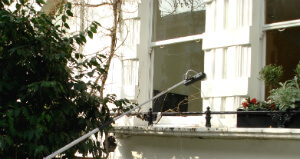 Window cleaning using the water fed pole method allows our technicians to reach up to the 4th floor of the house. The pole is attached to a water supply in the lorrie and is far quicker to use than the traditional ladder technique. Right after the whole window has been brushed the pole is lifted away from the surface of the glass, and more water is sprayed onto the window to give it a final wash. The window is left to dry normally and because the water is absolutely pure there are no mineral deposits or other residues left over. Because we care about our customers, we have devised a very basic and easy booking system for our window cleaning Finchley N3 and for our several other services. You can get a 100 % free price offer or schedule an appointment with our expert window cleaners by simply calling 020 3746 1366 or filling out the online reservations request form. The customer support team is readily available 24/7. You will receive an e-mail and a text message verifying your reservation in just 2 hours of your request. Pick just about any day of the year for making your reservation with us. We have fair rates. No advance payment is necessary for ordering this service. If you are booking earlier on or are a frequent customer, we will provide you our advantageous price for this and various other services. Property agencies and landlords also get lower price offers. Make sure you leave it to our professional cleaners to efficiently clean your windows, roof or gutters - order our high quality cleaning service today!